Tonight, I took my kids to the Eau Claire Children’s Museum. We have been going there since Grace was 5 or 6, and Michael was about 2. I have a great time watching how they play, learn, and grow! The EC Children’s Museum is downtown Eau Claire, about 2 blocks from dance class. Since we had a little extra time today, I took both kids there. After we brought Grace to dance, Michael and I went back. I’m so glad I got a family membership again this year, especially now that I know the one night they are open late is Thursdays, when Grace has dance! If you live in the area, and have never been there, it’s a lot of fun! If you are from the Cities, and have been to the Children’s Museum in St. Paul, you will be disappointed by this one – it’s about 1/3 of the size. Knowing that going in though, you will enjoy it – or at least, your child will! The main floor rarely changes. There is a “fenced in” toddler area for children under 4. It looks like a wilderness, with lots of fun activities. Since it is only for younger children, you don’t have to worry about new walkers getting trampled by big kids. On the main floor, there is also a “Bitty City”. The town has an orthodontist office, post office, grocery store, diner, bank, construction area, and a movie theater/ stage. New this year, was an addition to the construction area. There were hard hats for the children to wear, with tool sets to help them build the city. The main floor also offers a giant Digestive System for kids to crawl through. Many are intimidated crawling into the mouth for the first time. Usually after a few times crawling through the intestines, and getting pooped out the end, the kids love it! Another cool feature of the main floor, is that all the areas have working telephones in them. 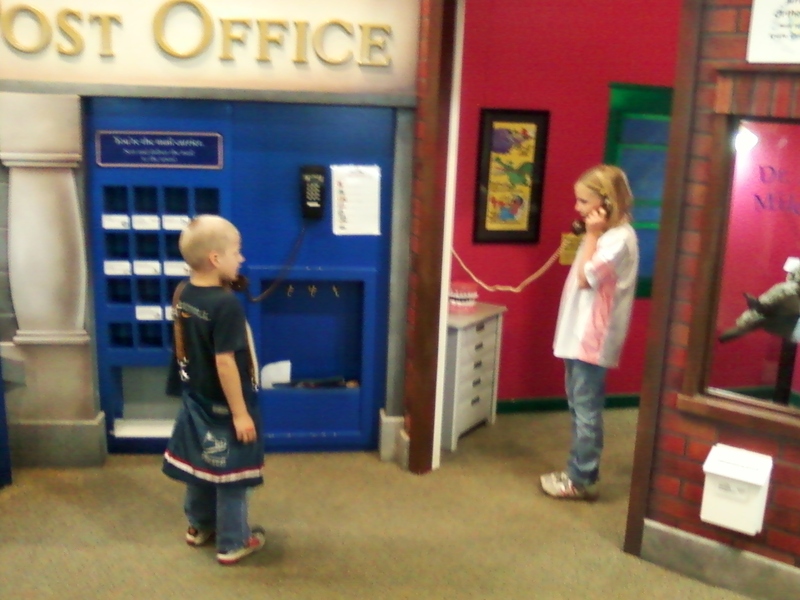 Children can dial a simple 2 digit number and call one of the other phones. I happened to answer a phone ringing nearby to find a girl named Gracie on the other end. It was not my Gracie. Later, I found out she also has a brother named Michael. How weird is that??? The lower level of the Children’s Museum changes every week. There is a large water area that was added about a year or two ago. That part doesn’t change, but never stops being fun for kids! There are several smaller rooms downstairs that offer different activities. In one room, there is always an art activity or two, along with some puzzles. Other rooms have different learning (read: fun) activities such as legos, patterning games, Magnablocks, other art activities, sand table with spiders… all of these activities change weekly, so it continues to be fun! Michael and I spent a long time constructing with the magnetic blocks. Who knew so many shapes could be created out of 3-D triangles!?! For some reason, the Darth Vader theme song popped in my head, and I started singing it while we played. A 5 year old girl said, “Hey, I know that song, it’s the Darth Vader song! I own all the movies, and Indiana Jones!” As if that didn’t perk Michael’s attention enough, she told him his structure looked like the Millenium Falcon!! I think it was love at first… well, you get the idea! The Early Childhood Teacher in me was watching how Michael played differently this time, compared to the last time we were there. The biggest growth has been in his pretend play. Not that he’s ever struggled there, but he was on a different level tonight. He was “making me dinner.” First, he had all the ingredients in a frying pan and a sauce pan. He put the frying pan on the stove, and put the sauce pan in the oven. He was tinkering around with some other things, then saw a cake pan. He said, “Oh, wait”, put on hot pads, took the sauce pan out of the oven, and poured the items into the cake pan. Then, he carefully put the cake pan in the oven for it to cook. While that was cooking, he poured the ingredients from the sauce pan onto a plate. Then, he started counting the money that was in the cash register. To him, this whole experience seemed more real. He seemed to want to do everything right. It was fun for me to watch Michael do other things too. 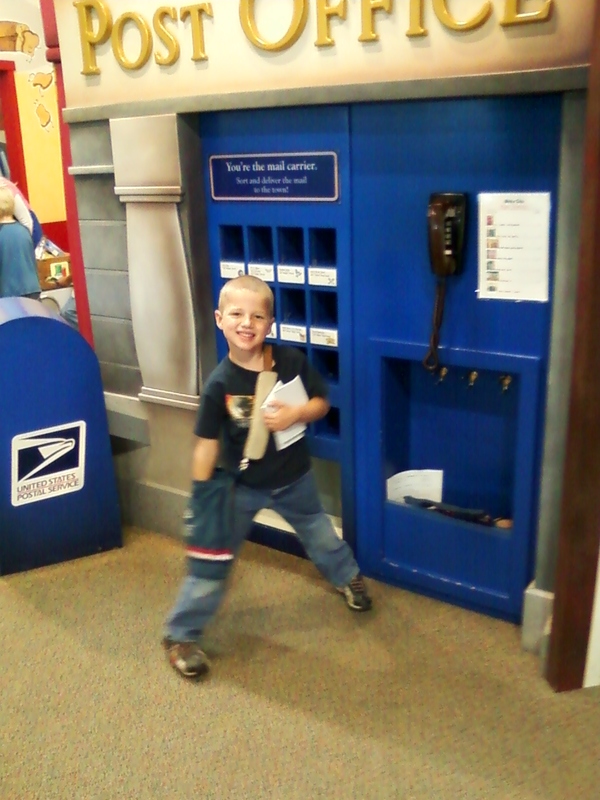 His favorite thing to do there has always been delivering the mail. Instead of just running around grabbing random “letters” and putting them in random mailboxes, he was actually looking at the picture clues, trying to put them in the right area. Then, he was asking me about the words on the front. This shows a lot for reading readiness! Every time I turned around, his play just seemed more purposeful – it was fun for me to watch (both as a Teacher and a Mom)! Grace has always enjoyed all the activities there. 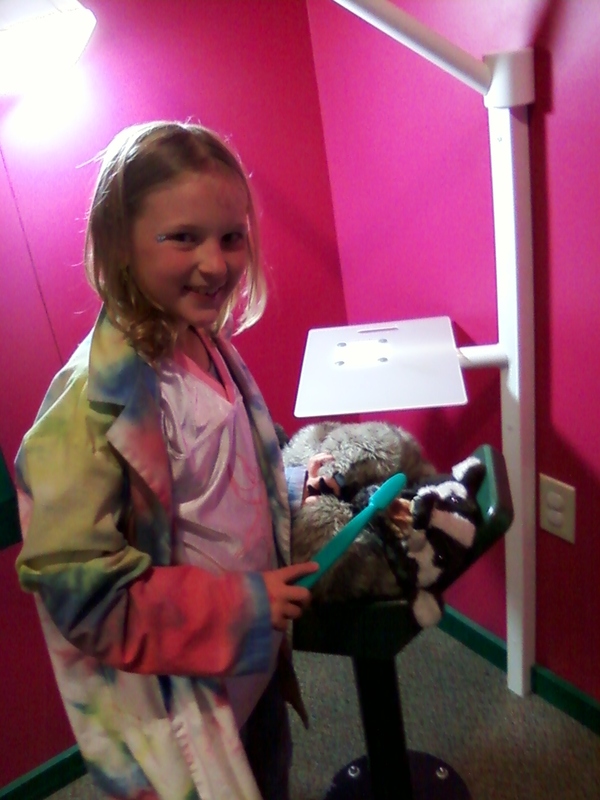 Her favorite is usually the dentist/orthodontist office and the theater (surprise, surprise)! Once again, the Sjolanders had a great night together!!! Side note: There are green flyers on the side of the welcome desk. The flyers are called, “Making the Most of Your Visit – a Guide for Grown-Ups.” I would recommend parents pick this up upon entry. It is not only educational for you, but has some tips on extra ways to enjoy the museum with your kids!